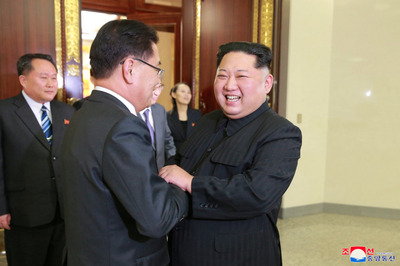 KCNAKim Jong Un giving a hearty greeting to Chung Eui Yong, the director of South Korea’s National Security Office, in Pyongyang, North Korea. President Donald Trump on Tuesday tweeted cautiously optimistic praise for inter-Korean talks that resulted in North Korea saying it would consider giving up its nuclear weapons. Trump has presided over a massive diplomatic, economic, and military pressure campaign that intended to get North Korean leader Kim Jong Un talking about denuclearization, and Kim appears to have caved to that demand. But North Korea has made overtures of peace before only to back out later, and the move could well be designed to buy Pyongyang time rather than to pursue peace. President Donald Trump tweeted cautiously optimistic praise Tuesday for inter-Korean talks that resulted in North Korea saying it would consider giving up its nuclear weapons. Trump has presided over a massive diplomatic, economic, and military pressure campaign that intended to bring North Korea to the table by shutting down its international trade and support while making heavy military overtures. The US has long insisted that before it engages diplomatically with North Korea, a country still technically at war with South Korea, the North must express a willingness to discuss denuclearization. On Tuesday, North Korean leader Kim Jong Un seemed to cave in to that demand. In the past year, Trump and Kim exchanged nuclear threats amid the tensest time on the Korean Peninsula in decades, but talks this week between the two Koreas have seemed to produce a change in tone from Pyongyang. Not only did Kim seem to reverse course on his nuclear arsenal, he did so without asking for much in return; North Korea asked only for a guarantee of its government’s security and removal of US forces from Korea. But North Korea has made overtures toward peace before, and it’s possible this is simply a gambit to buy more time to perfect its nuclear arsenal.